Back in 1993, Out of Eden co-founders Janet and Ian Hartley set out to reboot business with principles as well as profit by creating a company that treads lightly on the planet – one for which ethical business and service is paramount. 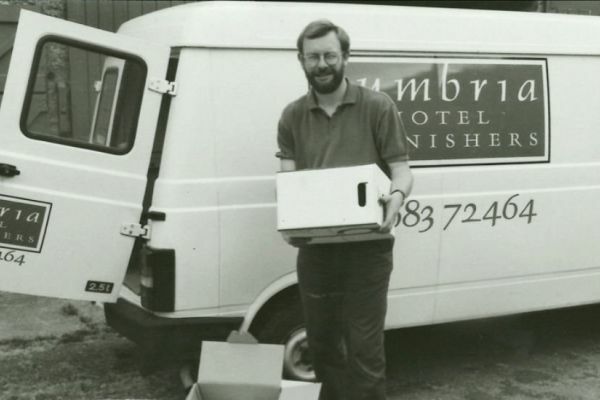 In looking to the future, it seems sensible to remember how we started, catering to the smaller B&Bs and hoteliers overlooked by larger retailers. 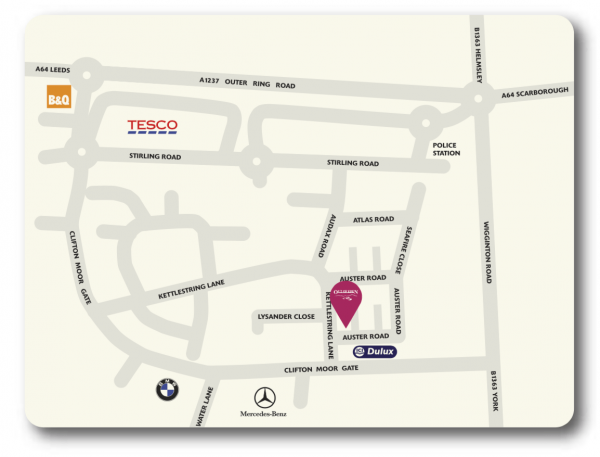 Now that we’ve grown, our customer base includes many larger as well as smaller clients, and reaches outside the UK. Our Business Development team are here and ready to work with larger-scale clients, whether they require stock level availability, competitive pricing, or assistance with quotations and orders. Every one of our customers counts. Just as when we first started up, we still put yellow memo pads in with packages, thanking customers for their order and soliciting feedback. It’s our way of passing on a touch of Cumbrian hospitality while listening to you, our customers, and, together with new forums for communication such as blogs like this one and most recently our new Facebook group we’ve recently created for those in the hospitality industry wishing to receive advice from peers and industry experts, discuss hospitality-related trends and share any top tips and tricks from bed linen, to going plastic free, to the daily running of a business (click here to join), it allows us to remain in dialogue with you. Inviting you to share your product ideas with us through an online competition for innovation ideas lets you tell us what you need, and opens up an avenue for product development. You get credit against future purchases for the best idea; we get an opportunity to design innovative products that help you. What we can offer that our very large competitors can’t or don’t want to, is a truly personal service provided by friendly knowledgeable team members who are just a phone call or an email away. Many websites today make it very hard to contact a person on the phone to help. We are proud to be different. 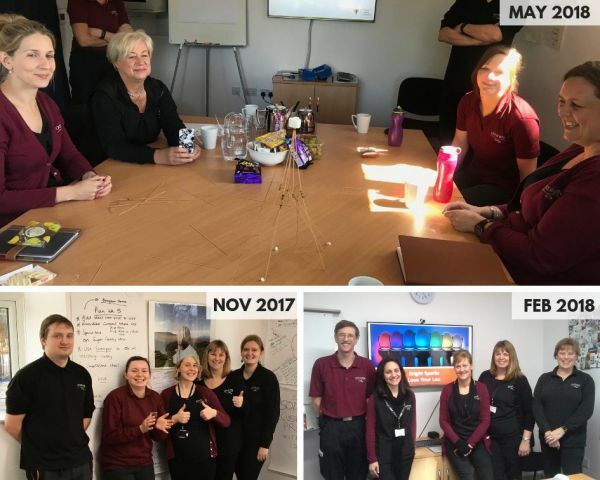 Since December 2017, Out of Eden has introduced a series of Product Champion workshops, created to generate ideas from every team member for new products or new services and new ways of working. There have been so many ideas for new products that we are struggling to make the time the time to bring them all to fruition says Alex, the New Product Development and Purchasing Manager. Customers too have been contributing their ideas through our product ideas page on the website where the person who submits the best idea each month receives an £80 credit to spend on Out of Eden goods. Mike Gannon, our ‘new’ Managing Director – already into his fourth year – is delighted to see innovation flourish, having been brought in in 2015 to grow the business while holding it true to the values held dear by the company’s founders. While Janet and Ian try and take a back seat – where will Out of Eden go, under Mike’s leadership? Then there’s the targets for environmental performance appraised annually by CBEN which become higher each year. 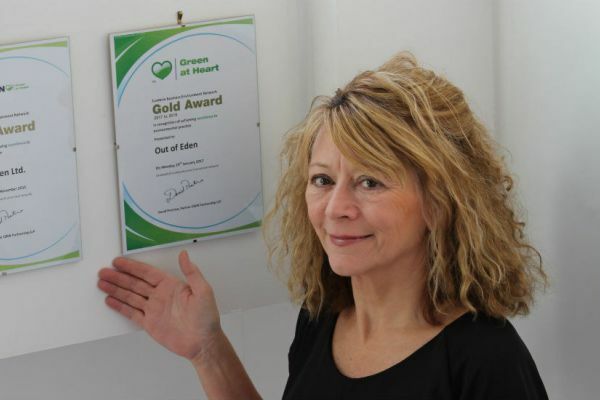 As Operations Manager Maria explains, “Keeping the Gold standard, means not just measuring up to last year’s high performance, but raising the bar and aiming higher. This year, that means reviewing energy use in all areas, implementing more low wattage LED lighting and even collecting bras and crisp packets for reuse and recycling." In 2019, we’re raising the bar higher by tackling the single plastics issue in partnership with Clean Conscience, a Maidenhead-based social enterprise that recovers, re-purposes and reuses the maximum amount of hotel soap and unused liquid in toiletry bottles while keeping the bottles themselves out of landfill. The process of recovering unused or partially used liquids from toiletry bottles and repacking them for distribution to women’s shelters at home and refugee camps abroad is carried out by a team that includes vulnerable people with special needs – providing workers with meaningful employment and an opportunity to engage and feel valued. In addition, hard soap produced from waste soap collected by Clean Conscience for distribution overseas provides communities with life-saving sanitation and an opportunity to generate an income. 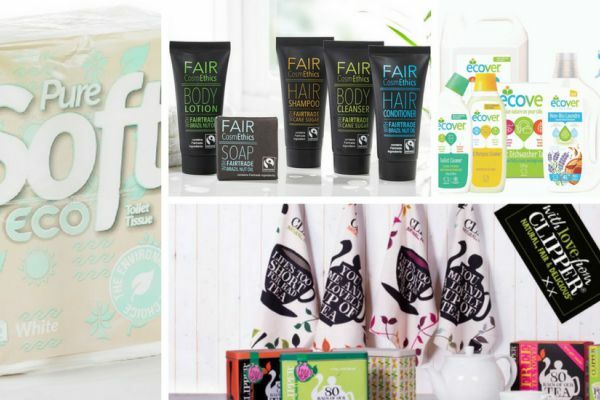 The Soap Box Scheme is central to Out of Eden’s partnership with Clean Conscience. As of January 2019, Out of Eden is encouraging B&Bs and small hoteliers to pay a one-off registration fee of £40 to Clean Conscience in order to join the scheme. Under the terms of the scheme, participating businesses will then collect up any partially or unused Out of Eden bottles and tubes together with Out of Eden bars of soap, for delivery to Clean Conscience, where the unused liquid or partly-used soap will be reprocessed and repurposed. Empty bottles and waste plastics are sent to a waste-to-energy clean burning incinerator. Businesses participating in the scheme pay a £5.50 processing fee to Clean Conscience for each parcel sent to Clean Conscience for treatment. This fee is then reimbursed by Out of Eden in the form of a £10 credit paid into the business’ account. The scheme’s societal and environmental benefits are outweighed only by the message the partnership sends out to people, in encouraging everyone in the supply chain – from the retailers and hospitality industry to the end users of the product – to take responsibility in doing their bit. It goes without saying that keeping plastics out of our oceans and landfill while reprocessing liquid toiletries and hard soaps for good causes is still only a first step: until governmental and/or industry guidelines are implemented restricting the kinds of plastics used in packaging to materials that can be efficiently recycled, it is down to consumers to think more carefully about their consumption habits, and suppliers to think harder about what to sell. This is why in addition to working hard to source alternatives to single use products, Out of Eden is actively providing product choice to our customers so they can provide guests with alternatives to single use plastic toiletries such as refillable liquid dispensers, be they 300ml bottles or larger dispensers in shower cubicles. We are also part of the Bio D refill station scheme in our Kirkby Stephen store and will continue to do this in others that we open. There’s a time for talk…. In Cumbria, where Out of Eden is based, caring for the environment is increasingly important to the hospitality trade, keen to play its part as the Lake District rises to the challenges as well as opportunities of UNESCO Heritage Site inscription, awarded in July 2017. Since B&Bs and hotels serving the Lake District rely on the landscape which brings millions to the region, it makes good business sense not only to protect the landscape on which their livelihood depends, but to fulfill visitor expectations – many visitors being eager to see tourism businesses supporting local areas and looking after local environments while caring for them as visitors. Larger hotels have both driven and responded to calls for responsible tourism by signing up to green tourism accreditation schemes that monitor everything from the re-using of guest towels and provision of liquid soap rather than individual packaged soaps, to the use of aerosol-free products, natural-based surface cleaners, and chlorine-free water treatment. What, though, of the smaller hotels and B&Bs for which the cost of signing up to green accreditation award schemes may seem too high? Although membership fees which go towards paying the assessors will be ideally recouped by the dividends possible from tapping into the growing market of tourists shopping around for “green” accommodation, such costs, along with the cost of implementing changes in line with audit recommendations may still prove prohibitive. Is there more that Out of Eden should be doing to help businesses like these not only make their operations more sustainable, but to do so in a way that is sustainable for them? We’re already offering guidance to the industry through our new Facebook community and blogs providing everything from encouragement to businesses to Go green in 2019 to hints on things to consider when starting a B&B in view of the hidden costs, licensing laws, and other matters which can help readers assess the challenges before mistakes are made. However, shifting the emphasis away from product-related blogging towards ‘how to’ content in blogs and social media forums may enable us to do more. We might look at sharing information and advice on which green accreditation agencies to go for, offer a sustainability toolkit to our customers, or better still, create one with them. Or how about offering some free publicity to our customers, with a hall of fame for B&Bs, hotels and self-catering cottages that are pitching in to do their bit, asking them to write in about what they’re doing and posting case studies of green hospitality providers on our social media? Naturally, we like to see ourselves as just such an organisation. That’s why with a new Out of Eden store set to open in York in March, we’re continuing to look at what more can be done as our business grows, not only to keep mapping out our own sustainability pathway, but to encourage you – our old customers and new – to map out your own pathways and to share them with us. Get in touch with us today, to have your say, and tell us what you’d like to see from us in the future. Join us on a journey about the social and environmental responsibilities of businesses, and why it's a subject close to our hearts. Our second installment in this 6-part series discusses environmental issues and offers a fascinating insight into on how Out of Eden address on-site power, wastage and recycling. Supplying problem-solving products that meet rather than create a need and addressing the changing demands and the ethics of sustainable supply. 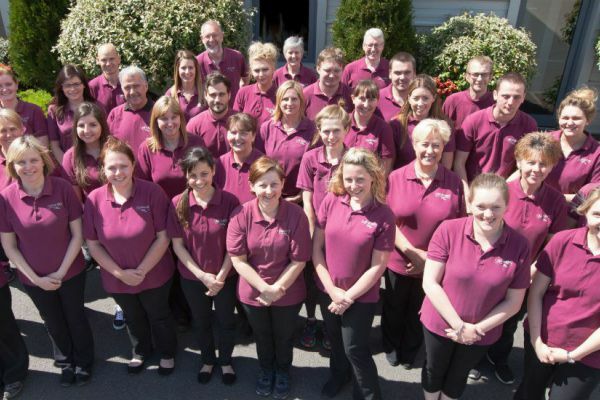 The saying 'your team is your best asset' has never rang truer than with us here at Out of Eden. Find out why in our fourth installment of a six-part series.